Welcome to another October 2014 issue of GL's Newsletter covering the latest hardware, software, applications and enhancements introduced to our versatile T1 E1 Analyzer product line - now Version 8.10.1. GL'stScan16™ is a high-density T1 E1 board with 16 Rx ports and the newer PCIe (x1) bus interface. The sixteen T1 E1 ports are Receive-only ports optimized for high performance voice and data capture, monitoring, and analysis requirements. tScan16™ extends the family of GL's T1 E1 platforms with greater density, increased ports, and reduced power. GL's Dual T1 E1 Express (PCIe) Boards are high-density Dual T1 or E1 boards with newer PCIe (x1) bus interface. These cards are identical to the portable tProbe™ units except for FXO FXS and Datacom functionality. 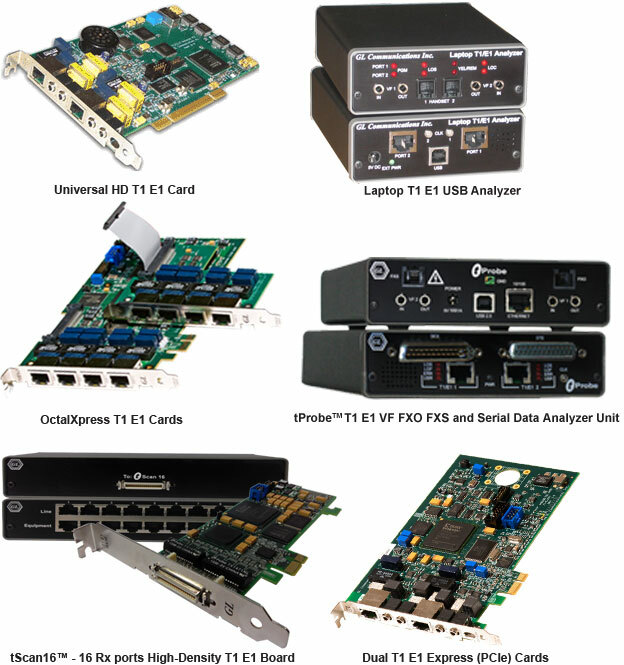 In addition to basic T1 E1 applications and optional special applications, Dual T1 E1 Express (PCIe) Boards also support enhanced VF drop and insert with software selectable VF Tx and Rx impedances (135 Ω, 150 Ω, 600 Ω, 900 Ω, or High), Pulse Mask Compliance, Jitter Generation and Measurement testing applications. The HDLC Tx Rx Server is GL's WCS based server module that provides HDLC frame transmit/receive capabilities over HDLC streams on T1 E1 lines. It permits to create multiple HDLC streams of various bandwidths (time-slots, hyper channels, and sub channels) and provides UDP interface to the client applications for data Tx/Rx over these newly created HDLC streams. The application (client) and the HDLC Tx Rx server exchange the data over UDP transport. MAPS™ IUP is an advanced protocol simulator used to simulate UK Specific SS7 IUP in British Telecom (BT) networks over TDM (T1 E1). It is designed to simulate Incoming and Outgoing Networks via Interconnect route as defined by the PNO-ISC/INFO/004(IUP) and TGS/SPEC/006 specifications. MAPS™ IUP functionality covers the UK variant of SS7 implementing MTP2, MTP3 protocol standards. A G.722 sample file inclusion in the installation subfolder "G722 Samples"
The CCA application is enhanced to capture SS7 calls on multiple T1 E1 trunks, which may use a signaling link that may be on a different physical trunk than the telephony circuits. The signaling time slots on other trunks may be used for a normal voice circuit. To allow capturing on trunks, CCA is enhanced with Circuit Identification Code (CIC) group configuration that includes Skip Timeslot 16 and non-consecutive CIC numbering options. The WCS application has been updated with the Launchpad to handle servers running with tScan16™, and Dual T1 E1 PCIe boards. Frequency Shift Keying Signal (FSK) demodulation is now made available in WCS using the "Monitor ADSI" command. This command instructs the GL Server to monitor the FSK signal arriving at the specified receive timeslot(s). INI Files have been updated for ATM, CAS, Frame Relay, GPRS Gb, GR-303, GSM, HDLC, ISDN, SS7, TRAU, UMTS, and V5.x Protocol Analyzers to display correct default set of summary fields. PDA is now included with PPP, PoS (PPP over SONET), Frame Relay, and UMTS analyzers for all platforms. Offline PDA analyzer is now supported for PPP protocol analyzers. PDA Offline analyzer includes the missing files, "megaco.dfa" and "megaco.llr" which help invoking MEGACO traces in PDA without any hassles. In addition to the above, there have been several modifications and bug fixes to the T1 E1 Software. For more details, please refer to the link what's new in the current version 8.10.1 web page.